Uncle Orland’s Celebration of Life was a wonderful chance to reflect on the many positive ways he impacted those around him. It was also a great chance to catch up with many of my relatives back in Michigan, both at the visitation Thursday night and at the luncheon on Friday. With growing excitement, we changed into our backpacking clothes after the luncheon and hit the road. We left early enough to hit only the earliest front end of the Memorial Day weekend traffic around Chicago, but that was bad enough. I paid the tolls and hopped onto the I-90 Skyway which let us sail along but once we merged back into I-94 traffic, it was stop and go all the way to Milwaukee! At least we would be able to cruise at 70 MPH for short stretches at a time before having to quickly slow to 40 MPH or slower for a bit. Still and all, it could have been much worse had we hit the brunt of the long weekend traffic. We took a break at one point to visit Gander Mountain. We were in need of fishing line and tackle that would hold up when we hooked that big Northern Pike we expected to find while backpacking. Later, after a gas break at Black River Falls at 11PM, Joey took a shift at driving while Eric and I worked on restringing our fishing reels. Despite the rain, Joey did a fantastic job of maneuvering as the deer continued on its unpredictable path from out of the dark median and over to the other side of the interstate. My biggest jostle was more as I tried to quickly turn to face forward and see what was happening. Joey got the van over to the side and then shut off the van when we realized the brake lines had been severed and he couldn’t bring it to a complete stop otherwise. Joey’s first thought — I’ve ruined our vacation. My first thought — you saved our lives! In hindsight, I suspect it was extremely fortunate that we had a fresh driver behind the wheel!! 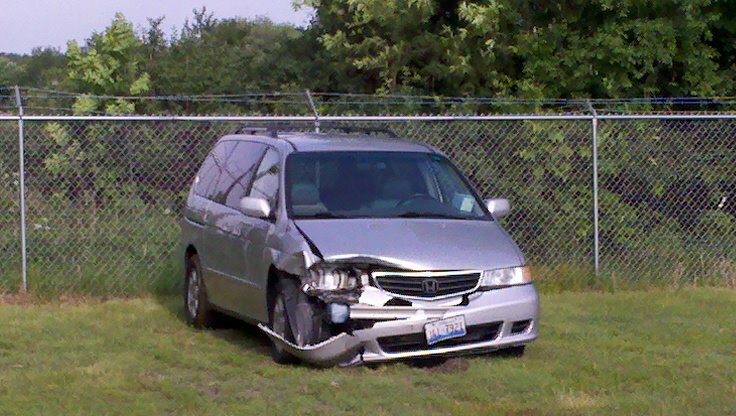 Rapid fire phone calls to 911, Loft Towing, Country Insurance, and the ferry boat company. Loft Towing is right by the Super 8 in Osseo, Wisconsin and in spite of a bunch of graduations in the area, the motel did have a room with two queens left. The towing guy says there’s no hiking trails immediately in the area and just one small pond to fish in. Plus he was doubtful we could find a car rental because of the holiday weekend. Yikes! Woke up relatively early Saturday — time to get Angie up to speed. I also managed to catch the Grand Portage * Isle Royale Transportation Line folks shortly after the boat sailed at 7:30AM. They hadn’t gotten my phone message from the night before — their phone system was having major problems. They did confirm they could reschedule us for their Monday morning ferry! Luck is with us and next I found an Enterprise car rental place in Eau Claire that was open until noon and had a vehicle available. The first taxi company, recommended by Enterprise, is booked until after 11:30AM. He recommends a second and they are available. I have a great talk with the taxi driver — after feeling each other out we have a fascinating discussion about the current challenges to our economic and political system and possible fixes. I walk into the airport — the national 800 number through whom I reserved said it was an airport location — only to find it deserted and no Enterprise center in sight, just a poster advertisement for them. A call to the local branch office, another taxi ride, this at their expense, and I’m at the Enterprise office at 11:40AM, 20 minutes before they close until Tuesday. Phew! I’m back at the hotel a little after noon. We eat our first “trail” lunch at the hotel, we clean out the van, setup the rods and reels in the safety of the hotel lobby, and even have the front desk staff recommend we try the new lures in their swimming pool since no one is using it. While I drove back to Osseo from Eau Claire, the boys began researching state park locations between us and Grand Portage, Minnesota; they found a gem in Tettegouche State Park. We set off for Tettegouche and quickly realize we’ll be passing by Chippewa Falls, Wisconsin. 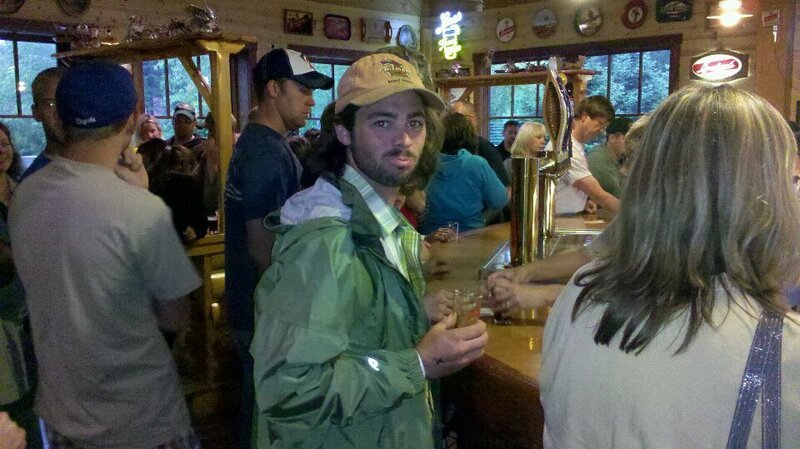 How about a stop at Leine Lodge?!?!! 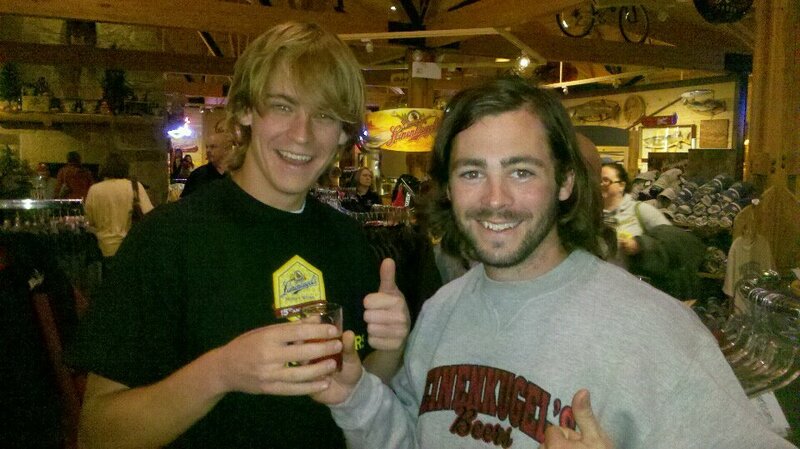 Eric celebrated the eve before his 22nd birthday sampling their brews. I was tired enough and so decided that with needing to drive several hours still I would hold off, taking small sips from Eric’s samples instead. It was a nice visit even though their brewery tour was booked. We finished the drive up to Tettegouche, ate our first “trail” dinner, and stayed at a nice walk-in campsite overnight. The next day we hiked to High Falls. It was awesome after 4″ of rain the preceding days. This looks like a wonderful future destination for car camping and hiking. Lot’s of trail options. 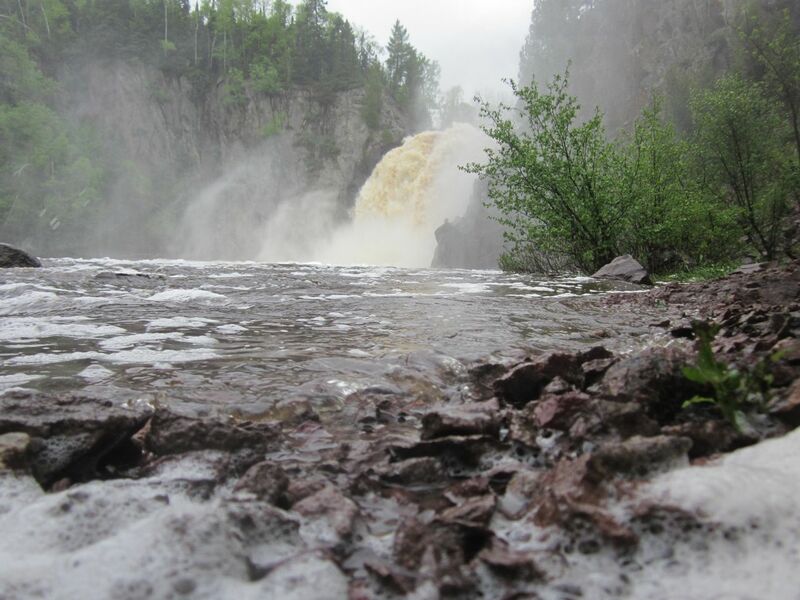 It’s also on the Superior Hiking trail, an interesting option for an extended backpacking trek. We leave mid-afternoon for the final push to Grand Portage. Is it possible we may actually make it? We stop at Grand Marais to pickup additional supplies — the boys realized light gloves would be very helpful given the cool temperatures, and Joey realized he had forgotten rain paints. We also had discovered that Eric’s tent had two big holes where the plastic “windows” used to be in the rain fly. We used a zip lock baggie and some seam sealer and duct tape I had in my backpacking repair kit to seal off the hole. That night’s rain did a great test of the patch, but the duct tape I had was a bit aged so we also picked up some new duct tape. The town of Grand Marais was very nice and we had a great chat with a fellow in the hardware store where we found the duct tape. 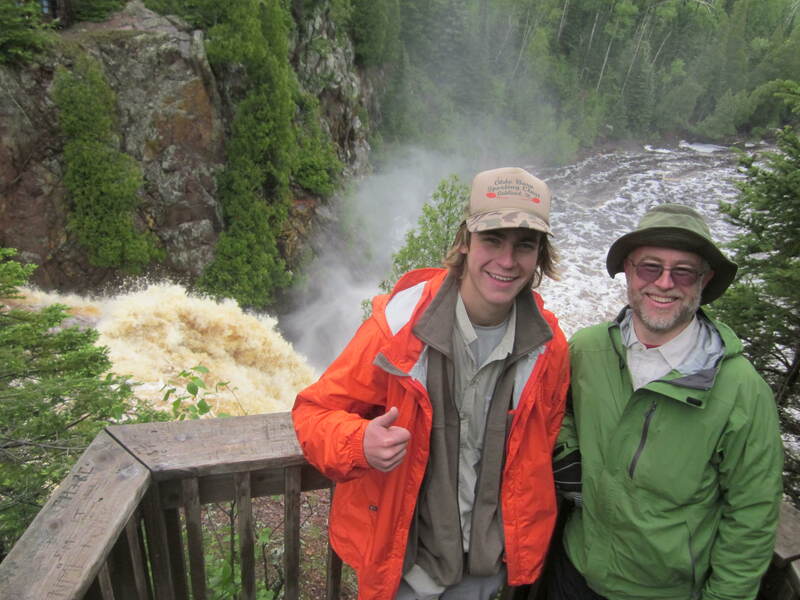 He had great recommendations for a future trip to the Boundary Waters. The Grand Portage RV and Campground is pretty basic. We’re right on the marina in a grassy area just down from an open area of RVs. But Joey wakes up to otters playing by the docks and it’s just a short drive to the ferry, which we make in good time on Monday. We’re off! 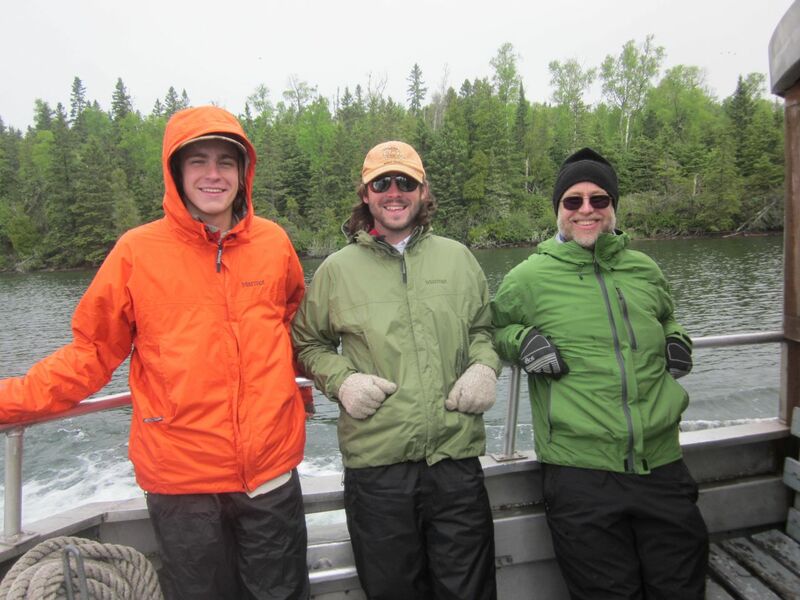 … but Lake Superior provided a very rough welcome and many people ended up feeding the fish (or trash cans). But as the waters calmed and we began seeing the island through the fog, we new for sure we were indeed going to make it! Arriving at Washington Harbor … we’re going to make it to the island! !